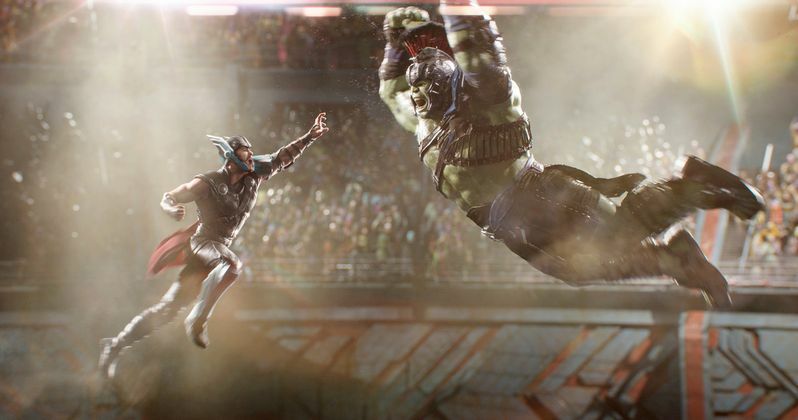 With just two new releases hitting theaters this weekend, both expected to have moderate success at the box office, Marvel's Thor: Ragnarok was expected to repeat at the box office, and it did so with ease. The Thor sequel dropped a respectable 53.9% in its second frame in theaters, pulling in a solid $56 million this weekend, which was more than enough to take down the two newcomers this weekend, Paramount's comedy sequel Daddy's Home 2 and 20th Century Fox's adaptation Murder on the Orient Express While both newcomers fared well in their opening frames, they still couldn't come close to the mighty Asgardian. Thor: Ragnarok remained in 4,080 theaters this weekend, pulling in an impressive $13,873 per-screen average for its second weekend. This tally has now brought Thor: Ragnarok past the $200 million domestic threshold, with $211.5 million domestic and $650 million worldwide through its box office run, from a $180 million budget. In just 10 days, Thor: Ragnarok has already surpassed the first two Thor movies both domestically and globally, and it also stands as one of the MCU's best-reviewed movies ever at 93% on Rotten Tomatoes, coming in just under the 94% for the very first MCU movie ever, 2008's Iron Man. Debuting in second and third places respectively are Daddy's Home 2 with $30 million and Murder on the Orient Express with $28.2 million. Given how close both of these movies are together in the estimates, it's completely possible that the movies may switch places tomorrow when the actual figures are released, but we'll have to wait and see. For Daddy's Home 2, which brings Mel Gibson and John Lithgow into the franchise, the opening weekend tally falls below the $38.7 million debut of the original 2015 movie, which became one of the surprise hits of that year by taking in $150.3 million domestic and $242.7 million worldwide, which lead to the sequel getting the green light. Neither of the newcomers were particularly blessed with critical approval, with the Murder on the Orient Express adaptation earning a middling 56% on Rotten Tomatoes while Daddy's Home 2 only received a 13% rating on RT. Still, both movies fared well, and had budgets that were modest enough to ensure that they will both likely be profitable, barring a disastrous drop next weekend. Daddy's Home 2 opened in 3,575 theaters this weekend for an impressive $8,392 per-screen average, from a $69 million budget. Murder on the Orient Express opened in 3,341 theaters for a stellar $8,441 per-screen average, from a $55 million budget. The top 10 was rounded out with quite the surprise in the 10-spot this weekend. A Bad Moms Christmas dropped just 31.3% in third place with $11.5 million, followed by Jigsaw ($3.4 million), Boo 2! a Madea Halloween ($2 million), Geostorm $1.5 million), Blade Runner 2049 ($1.4 million), Happy Death Day ($1.3 million) and Lady Bird ($1.2 million). Lady Bird, which marks the directorial debut of actress Greta Gerwig, opened in limited release last weekend, taking in an incredible $364,437 from just four theaters for a whopping $91,109 per-screen average, which broke the record for the highest per-screen average for a female director. This weekend, it expanded to 37 theaters and still managed to crack the top 10 with a supremely impressive $33,766 per-screen average. It remains unclear if there are further plans to expand Lady Bird nationwide, but given it's incredible first two weekends, that wouldn't be the least bit surprising. Also opening in limited release this weekend is Fox Searchlight's Three Billboards Outside Ebbing, Missouri, which earned an incredible $320,000 from just four theaters for a massive $80,000 per-screen average, while Atlas Distribution's No Greater Love earned just $21,821 from 22 theaters for a dismal $992 per-screen average and The Orchard's Thelma earned $12,357 from one theater. Looking ahead to next weekend, Warner Bros. will roll out its highly-anticipated Justice League in theaters, which actually has some competition in wide release, with Lionsgate's drama Wonder and Sony's animated comedy The Star. While neither movie appears to give Justice League a huge run for its money, most Marvel movies like Thor: Ragnarok open with no other competition in theaters, so it will be interesting to see if this counter-programming strategy pays off for Wonder and The Star, or if they'll both tank against the superhero ensemble Justice League. Take a look at the top 10 estimates for the weekend of November 10, and check back on Tuesday for next week's predictions.